⅓ cup Porto Rico molasses. 1 cup pecan meat cut in pieces. Mix ingredients in order given. 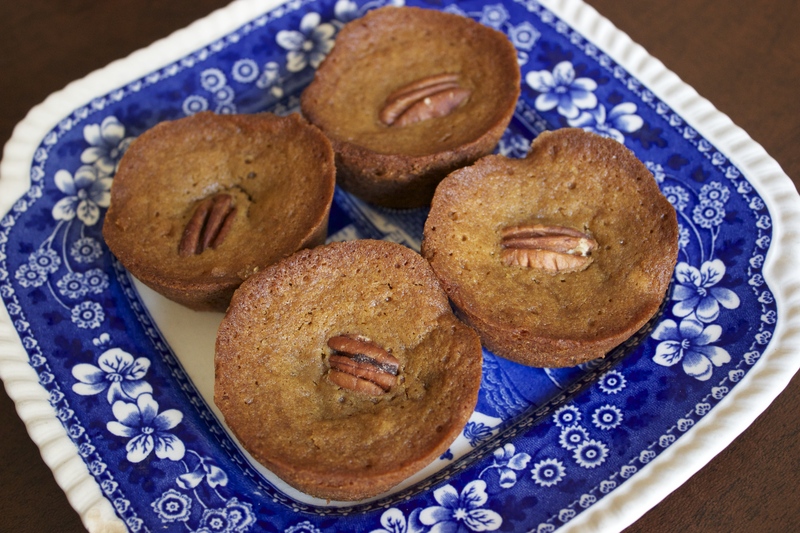 Bake in small, shallow fancy cake tins, garnishing top of each cake with one-half pecan. I tried this recipe, using muffin tins since I had no fancy little cake tins. I baked the brownies at 375°F for about 15 minutes. 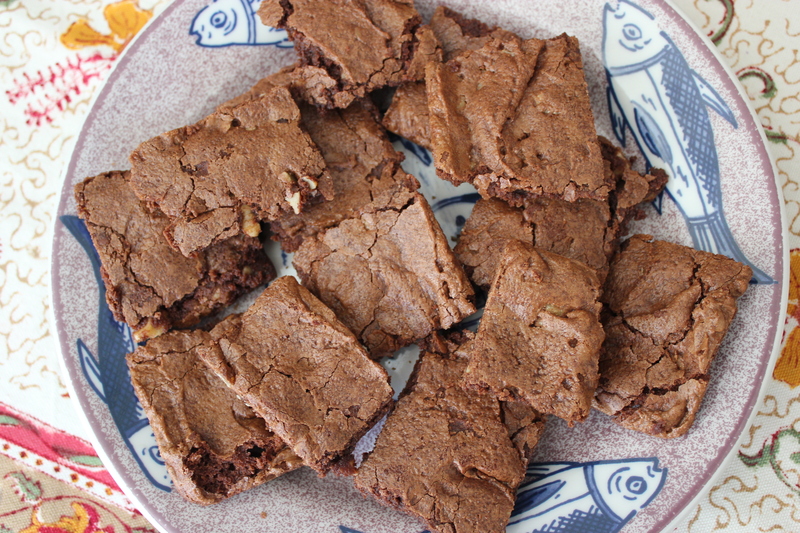 They were pretty good — similar in texture to a modern-day brownie, but with a rich molasses flavor. Why did Farmer call them brownies? One possible source is the Scottish word brooni, an oatmeal gingerbread. A more convincing theory, described in The Oxford Companion to American Food and Drink, is that the name was inspired by characters called Brownies, which were created by Canadian author Palmer Fox in the 1880s to illustrate verse books for children. These mischievous little sprites became wildly popular, and their name was soon used by others. Some confectioners adopted the name for molasses and chocolate candies, and although we don’t know exactly what was in these candies, their name was possibly borrowed for the cakier creation now known as the brownie. Until recently, food historians believed that Fannie Farmer published the first chocolate brownie recipe, in 1906. But research by Mary E. Gage, described on her website New England Recipes, has unearthed two 1904 recipes. Both were published in community cookbooks, one in Laconia, New Hampshire, in Home Cookery, the other in Chicago, Illinois, in the Service Club Cook Book. The Illinois recipe is called “Bangor Brownies,” which may support a story that the brownie originated in Maine. Legend has it that a Bangor woman was about to throw out a collapsed cake but, being a frugal New Englander, she decided to cut it into squares instead. Her accidental dessert was a hit, and soon people were making it on purpose. Mix ingredients in order given. Line a seven-inch square pan with paraffine paper. Spread mixture evenly in pan and bake in a slow oven. As soon as taken from oven turn from pan, remove paper, and cut cake in strips, using a sharp knife. If these directions are not followed paper will cling to cake, and it will be impossible to cut in shapely pieces. I made this recipe using buttered parchment paper instead of “paraffine” (wax paper), which shouldn’t be used in an oven. I also didn’t have a seven-inch pan so used an eight-inch one, and the brownies came out a little thin. But they were wonderfully chewy and chocolatey, and are well worth making (see photo at top, and my adaptation below). The batter is very stiff, but if you spread it in the pan with an offset spatula, it’s manageable. Cream butter, add remaining ingredients, spread on buttered sheets, and bake ten to fifteen minutes. Cut in squares as soon as taken from oven. This recipe, which was almost identical to the 1904 ones mentioned above, was soon reprinted in many other cookbooks, and its ingredient proportions remain common today. 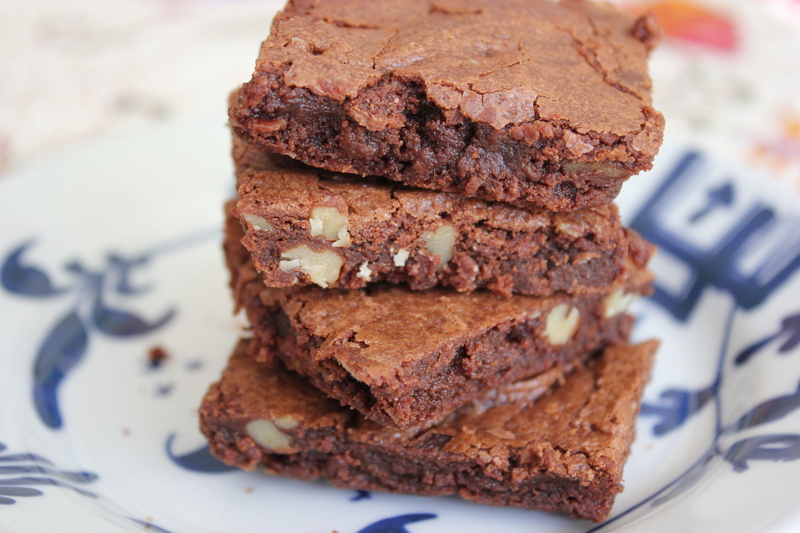 My adaptation of the Lowney’s recipe follows (below the one for Fannie Farmer’s brownies). These brownies are deliciously fudgy and moist, not as chewy as Farmer’s. My daughter called them “awesome.” She’s right, though I loved Farmer’s brownies, too. The brownie would continue to evolve over the 20th century — and I suppose it is still changing — with cakier versions (with more flour and leavening), layered bars, and all kinds of mix-ins. But I think both of these early recipes really needed no improvement. 1. Preheat oven to 325°F. Butter an eight-inch square baking pan, then cut out an eight-inch square of parchment paper, place it in the bottom of the pan, and butter the parchment. 2. Blend melted butter with sugar. Add the egg and beat well. Mix in slightly cooled chocolate and vanilla extract and stir well. Blend in flour, followed by walnuts. 3. 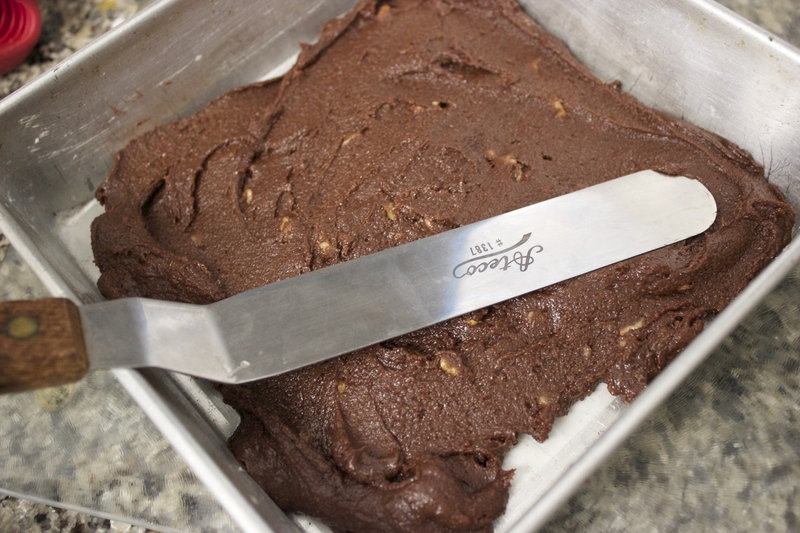 Spread mixture evenly in baking pan, using an offset spatula if possible. Bake for approximately 30 minutes, until firm. Let rest a few minutes, then invert brownies from pan onto cutting board, peel off parchment, and slice into squares. 2. Cream the butter briefly, then gradually add the sugar, and cream well. Add the eggs one at a time, beating well after each addition. Blend in the slightly cooled chocolate. 3. Whisk together the flour and salt, then add to the batter and mix well. Stir in the nuts. 4. Pour batter into prepared pan and bake for 30-35 minutes, or until slightly firm on top. Cut into squares in pan, then let cool for 15 minutes before removing from pan. This entry was posted in cake, dessert and tagged baking, Bangor, Boston Cooking-School Cook Book, chocolate brownie recipe, Fannie Farmer, food history, Lowney, Maria Willett Howard, Palmer Fox, Palmer House by revolutionarypie. Bookmark the permalink. I am drooling and licking my screen. Thanks for all the brownie history — the ones you made look so good! Thanks, Jama. And now I need to bake some healthy stuff for a while. Back to bread, most likely. Wow, I’m passing this along to my brothers. Will try the Fannie Farmer one first. My great Aunt added a tablespoon or two of coffee to her recipe; I wonder how far back that twist went? Good question, Wendy. I know there was mocha cake in the very early 20th century, and coffee cake with coffee in it. Not sure about brownies. I’ll let you know if I find out more. You and your family must have enjoyed this recipe exploration! Interesting that some of the oldest recipes called for molasses, which may have been more readily available than sugar. Thanks for posting so many possibilities. We did enjoy it, but now a break from chocolate and sugar would be a good idea. But these recipes aren’t nearly as rich as many modern ones — except for the Palmer House brownies, which have a shocking amount of butter and chocolate in them (I didn’t publish that recipe since its origin date was so unclear).